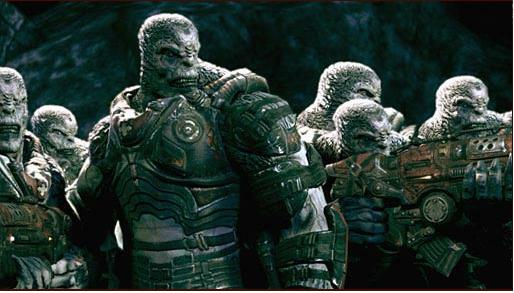 Here are some pics and descriptions of creatures from the Gears of War game series showing how I would adapt them the fantasy setting I described here. Of the horrible creatures which make up Locust horde Drones are probably the most numerous. Possessing a low intelligence and a high level of physical strength Drones are the front line soldier of the Locust armies. Drones (also called Grubs by the surface dwellers) are stocky and muscular: about the height of a man but more powerfully built. Drones have a reptilian appearance, hairless and scaled, with a chalky white skin coloration. In battle Drones arm themselves with scavenged or crudely made weapons and armor, typically using cleaver like swords. Drones have an aversion to bright light and cannot tolerate direct sunlight so the often wear hoods or goggles when venturing above ground during the day. 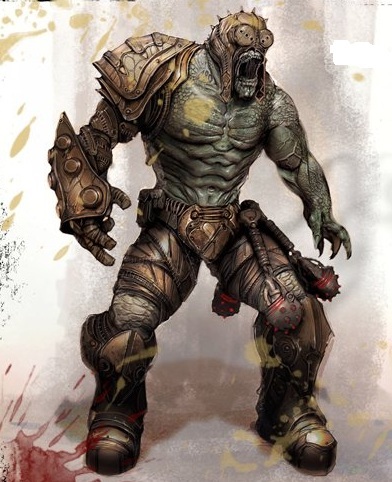 Drones would pretty much use the same stats as Orcs, maybe with a slightly improved AC to account for their naturally tough scaled skin. The Wretch is a vicious and dangerous creature. Although short in stature Wretches are ferocious- and they hunt in packs. Wretches are not intelligent even when compared to the dimwitted Drones, but they do possesses a animal cunning which can catch their opponents off guard using pack hunting tactics to flank or ambush their prey. 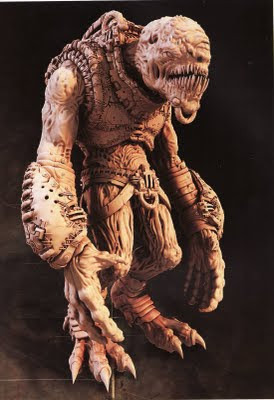 Wretches are excellent climbers and can traverse walls and ceilings just as easily as open ground, they usually leap about on all fours only standing upright to swing at prey with their lethal fore claws. Wretches would use the same stats as goblins but instead of giving them weapons they would get 2 1d4 claw attacks and the ability to run across walls and ceilings. Those are cool designs, for sure.